Access to high-quality, trustworthy abortion care is central to our ability to control our bodies, our lives, and our futures. Advancing abortion care means both ensuring that abortion clinics are safe for patients and providers, and preventing the deception of “crisis pregnancy centers,” which are fake clinics that lie and deceive women. 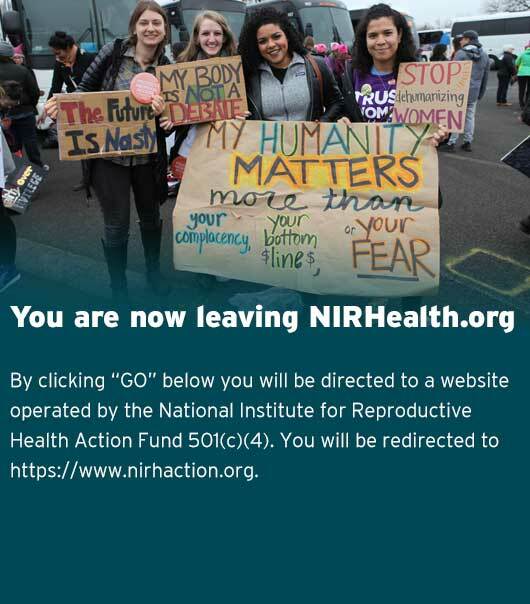 For the last decade, NIRH has worked to increase access to reproductive health care facilities that provide abortion, using all the policy tools at our disposal to ensure that women are able to access the quality care they need free from fear, intimidation, and violence. NIRH works with partners to develop local policy strategies to address clinic violence, encouraging clinics and advocates to seek appropriate policy remedies for threats to patients and clinics in communities. At the same time, we’ve worked to ensure that so-called crisis pregnancy centers – fake clinics that pose as legitimate reproductive health care facilities – are not able to deceive and manipulate women in an effort to prevent them from making their own decisions about abortion. Nearly 2,500 fake clinics exist in communities across the country. Common tactics of fake clinics include presenting an aura of medical authority to trick women into thinking they are in an abortion clinic, lying to women about the gestational age of their fetuses, and dispensing intentionally misleading information to prevent women from accessing abortion. NIRH has worked with advocates to pass city regulations in cities across the country, including Austin, Baltimore, Hartford, and New York City. Although some of these ordinances are no longer enforced following legal challenges, advocates in several cities have been successful in regulating these dangerous centers. Amidst ongoing momentum at both the state and local levels to improve access to reproductive health care, NIRH will continue to work with advocates on the ground to fight the deception of fake clinics in cities and states across the country.